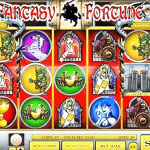 Fantasy fortune is yet another slot game by Rival. Created in 2007 it is certainly more of the more veteran games in their rich arsenal. As you might guess it really looks like an old and dated game. The kind you’re not so nostalgic when thinking about. The scatter in this game is the Door symbol which will trigger the bonus round when landing 3 or more. The other scatter is the Wise Wizard symbol. 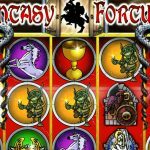 3 of those will give you 10 free spins with a 3x multiplier. The Wild Dragon will give you 5000 coins for 5 of him and 1000 coins when you land 4. 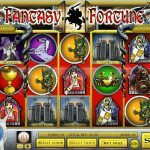 The big bucks you earn when you land the Jackpot Castle. 3, 4, or 5 will win you 2500, 10000 and 50000 coins!!! You want to play something a bit more modern? Try playing Doo Wop Daddy-O a 5 reel slot by Rival.